The French Quarter, Bourbon Street, Preservation Hall, Tom Benson. Pat O'Brien's, Antoine's, Pascal's Manale, Tom Benson. Sort of ruins your appetite, doesn't it? 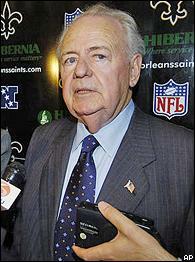 In New Orleans, Tom Benson is as well known as any of those beloved tourist attractions. Yet all Benson did was buy a football team. New Orleans' team. Its beloved Saints. It's time for Tom Benson to hand over the Saints to someone else. Forget for a moment all the restaurants and jazz joints and Creole mystique that makes N'awlins such a black-magical destination for those of us who have visited for Sugar and Super bowls. For many who live -- or lived -- there, the 38-year-old Saints just might have been dearer to their hearts than any of their internationally known landmarks. I can't begin to relate to the losses of lives -- and lifes -- in this hurricane-ravaged region. Homes destroyed, identities lost. But I do know this: Nothing can reunite a community like a sports team. Not just any team, though. One that consistently makes its fans proud to be customers and residents of that team's city. One that always gives them hope. One that, after its most devastating losses, still makes its fans believe it has a plan and a clue. One that is not owned by Tom Benson. Benson is basically what's wrong with the Saints. Benson is why I wouldn't wish them back on New Orleans. Or on San Antonio. Or on Los Angeles. Strictly from a sports perspective, Benson is why I feel sorry for New Orleans. And Benson is why I haven't been able to dredge up any sympathy for the crumbling Saints. The cold, hard truth is that Hurricane Katrina merely postponed the inevitable collapse of Benson's team. Yes, after pulling off a season-opening 23-20 upset win at Carolina, the homeless Saints were being hailed as "America's Team." Now, they're 2-6, and even Saints fans are having a tough time caring about them. The back-to-reality truth is that it took a natural disaster to turn coach Jim Haslett into a sympathetic figure and probably save his job. Poor Jim? Poor Saints fans. The best thing that could happen to Saints fans is for their team to return to a remodeled Superdome next season with an overhauled management.